To be honest, Hungary has never been on my list of places I wanted to travel to. I didn't know anything about the culture, the history, the food, the language, the architecture, etc. So when I was given the opportunity to go, I took the chance, going head first to a place I knew nothing about. It was a little scary, intimidating, and thrilling, but every second I was there was undeniably worth it the feeling of unfamiliarity. I’m not say why they named it “Hungary” because you’re always full of food when you’re there. Most likely full of goulash + chimney cakes. Not to be dramatic, but I would give my left arm to eat another Kürtőskalács. So… first things first. I guess I should mention why I went in the first place if it wasn’t on my list of places to see. My dad is an architect and he was lucky enough to be offered a spot at a convention in Budapest. He obviously accepted and booked flights for my mom, my sister, and me to tag along. While he was in meetings and dinners and conferences that we didn’t need to/couldn't attend, we explored Budapest on our own. When we first arrived in Budapest, we slept. For hours. It was stupid of us, truly, and I shouldn't have caved in. But hotel beds...are..so...comfortable.. When we woke up, we realized we hadn't eaten a good, wholesome meal in hours. Thankfully, the architect convention was throwing a dinner for the people involved + their guests. There was plenty of alcohol, mashed potatoes, burger sliders, fried mac and cheese, and more. Oh, and of course desserts on desserts on desserts. It was amazing. So day 2. My mom, my little sister and I attended a group tour with the other spouses + guests. We explored the town of Szentendre in the pouring rain: we saw businesses, churches, museums, a small restaurant with a famous Hungarian pianist sitting next to us, apparently. The next day, my mom, my little sister and I explored the Pest side of Budapest. We walked almost an hour to a Holocaust Memorial Museum. We left the place silent and crying. 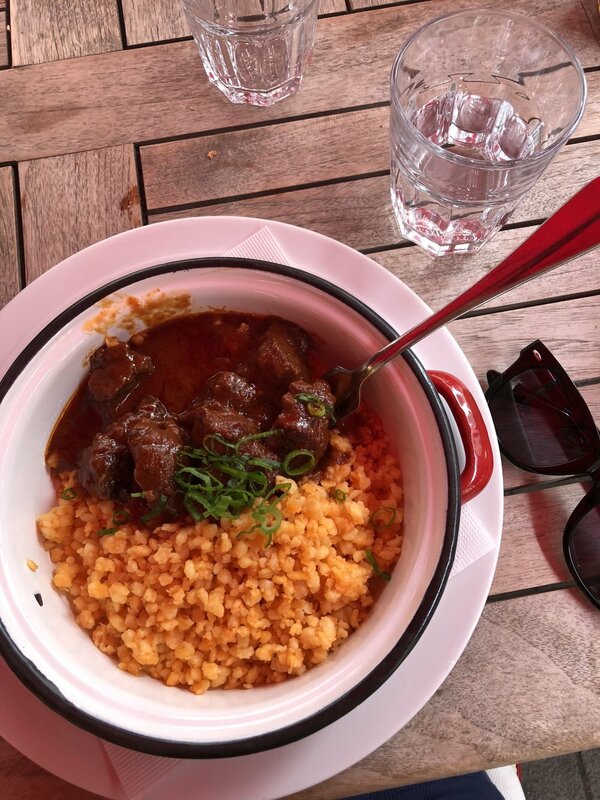 We ate more goulash. We gawked at the architecture. That night, we enjoyed dinner at the hotel restaurant and ordered room service for dessert! The next day was more exploring, but this time, the Buda side. Because my dad was able to join us, the day was going to be full of architecture - no questions about it. We visited the Buda Castle, Fisherman's Bastion, many churches (and spotted a wedding!) and roamed the grounds of Buda. Obviously they have other names in Hungarian but I would absolutely butcher it if I tried. I'm sorry. I ate more goulash. My sister ate some sort of pasta deliciousness. I downed a cappuccino while my parents shared an apple pie. Then later that night, we all ate cinnamon chimney cakes. UGHHHH. The final day in Budapest started at 4am. We packed our suitcases, showered, and checked out. We walked across a bridge, admiring the quietness of the Danube at 6am. We arrived at the Gellert Baths ready for whatever we were about to experience. Let me tell you, these thermal baths (the water was 70+ degrees!) were everything I had hoped and dreamed about. Maybe it was because it was 7am and the place was nearly empty. There were no screaming kids, no loud talkers. There was only silence and warmth. After two hours in the bath (or...hot tub? ), we gathered our things, walked back to the hotel to pick up our suitcases, and headed for the train station. And then we were off to Austria.